Growing your own food is one thing, but eating the food you grow is a whole other thing. You have to be prepared with recipes and ideas of how to use the abundance of food that nature gives you. Recently, after a wet period, our spinach went feral, and I had to figure out what to do with all those delicious, healthy green leaves. Of course this is just one example of an over abundance of fresh veggies, which prompted me to start posting some recipes to help us all use our home grown veg. 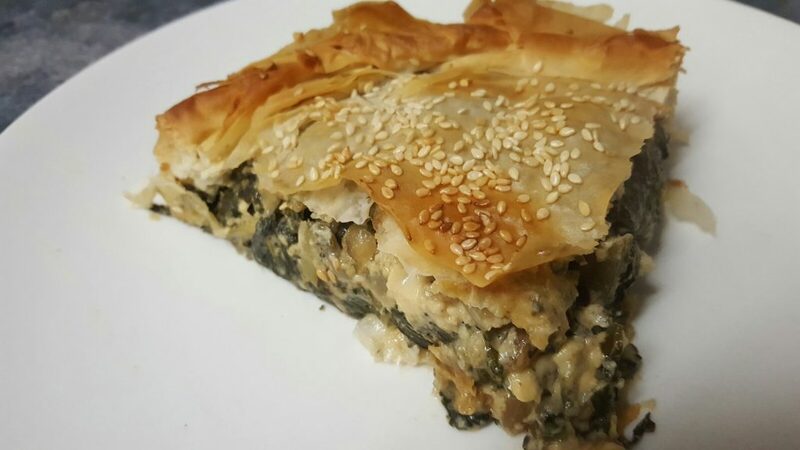 Here is the Spanikopita recipe I used, it was delicious and creamy inside and lightly crunchy on the outside. I like this recipe because it also uses fresh herbs also found in our garden. 3. Heat a pot with 1-2 teaspoon olive oil on low to medium heat, add the greens and heat until spinach is wilted- about 3 minutes and liquids have evaporated. 4. Place spinach in colander and let it drain and cool. Once cool, squeeze the liquids out with your hands, place in large bowl. You need to drain as much liquid as possible, it must be dry or the pastry will be soggy. 6. Take a round 8-9 inch spring form pan and brush with olive oil. 7. Spread a phyllo sheet and cut in half. Place phyllo in pan with the excess pastry draping over the edge of the pan. Brush each sheet with olive oil and continue until you have 6 layers. 8. Empty the greens mixture in the pan, spreading evenly. 9. 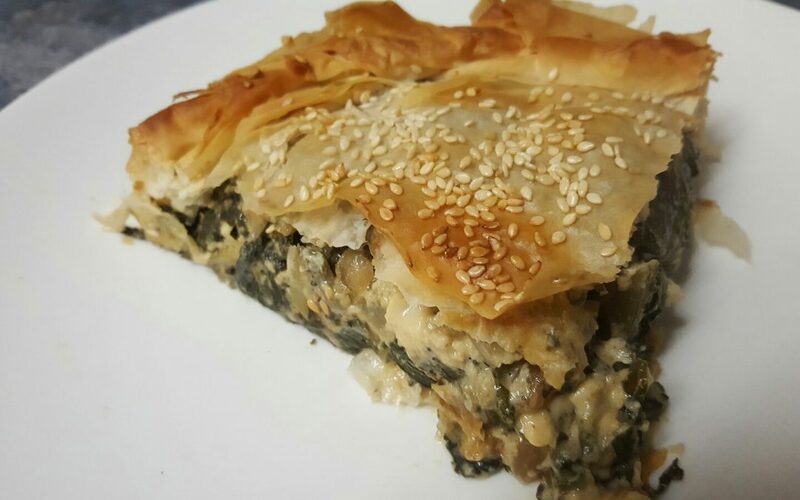 Cover with 6 layers of phyllo using the same technique as before. 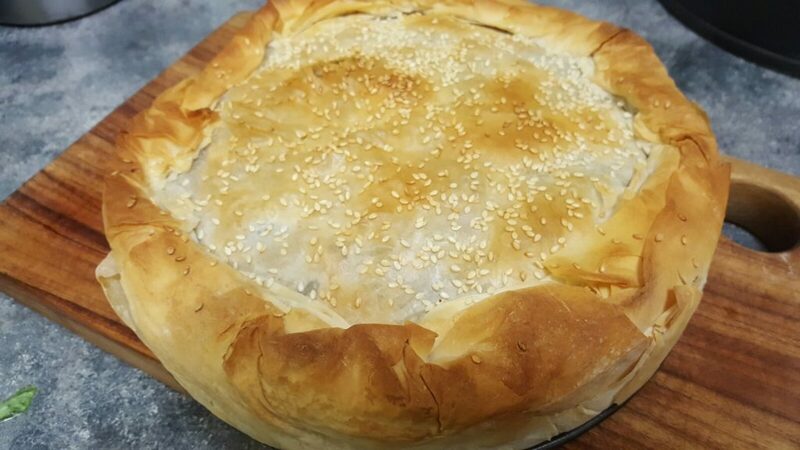 After placing the last phyllo sheet roll the edges under and tuck in the side of the pan to make a crispy edge then brush with olive oil and sprinkle with sesame seeds avoiding the edges. 10. Bake in the lower level of the oven for about 45 minutes. 11. Remove from spring form pan and let it cool. It can be enjoyed warm or at room temperature.